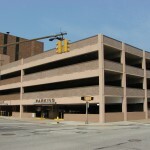 This 310 space garage located at 24 East 8th Street in close proximity to the Warner Theater, Erie Insurance Arena, and Jerry Uht Park. The garage is lease parking only at a cost of $60.00 per month. Event parking is available for $4.00. 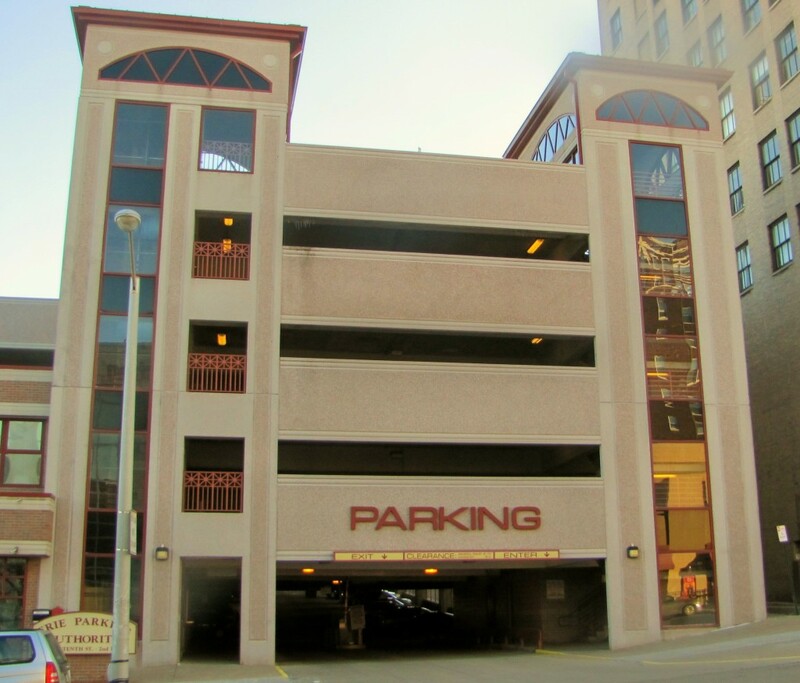 This garage can be accessed via entrances on East 8th Street or French Street and has one exit on East 8th Street. Maximum vehicle height is 6 feet 10 inches. This 563 space garage located at 120 West 9th Street is adjacent to the campus of Gannon University and attached to the Palumbo Center. 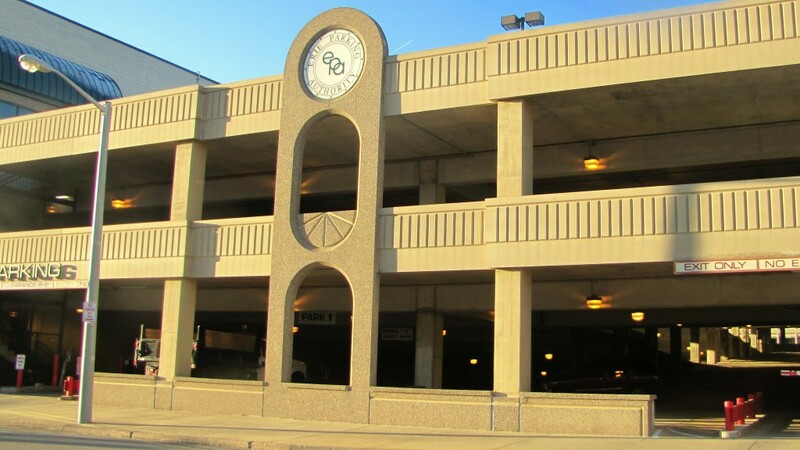 The garage offers a choice of lease parking at a cost of $60.00 per month or hourly parking ranging from $2.00 for the first hour to a daily maximum of $10.00. All daily parkers must exit the garage by 10:00 p.m. This garage can be accessed via entrances/exits on West 8th and West 9th Streets. The West 8th Street exit is for lease parking only. Maximum vehicle height is 6 feet 6 inches. 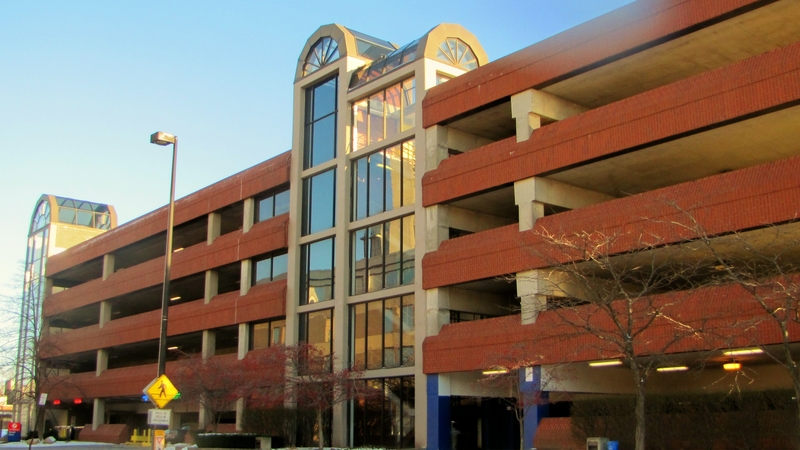 This 371 space garage located at 140 West 9th Street is adjacent to the campus of Gannon University and O.C.Y. The garage is lease parking only at a cost of $60.00 per month. 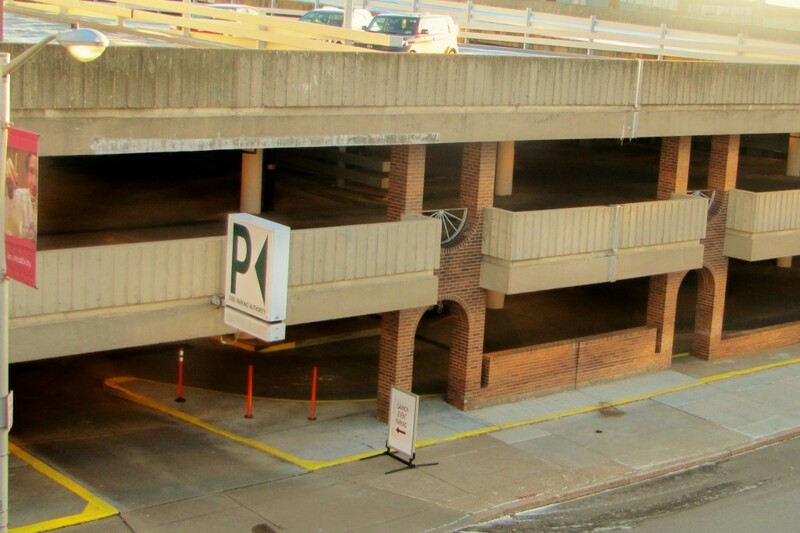 The garage can be accessed via entrances/exits on West 8th and West 9th Streets. Maximum vehicle height is 8 feet 6 inches. This 496 space garage located at 25 East 10th Street is across the street from Jerry Uht Park. 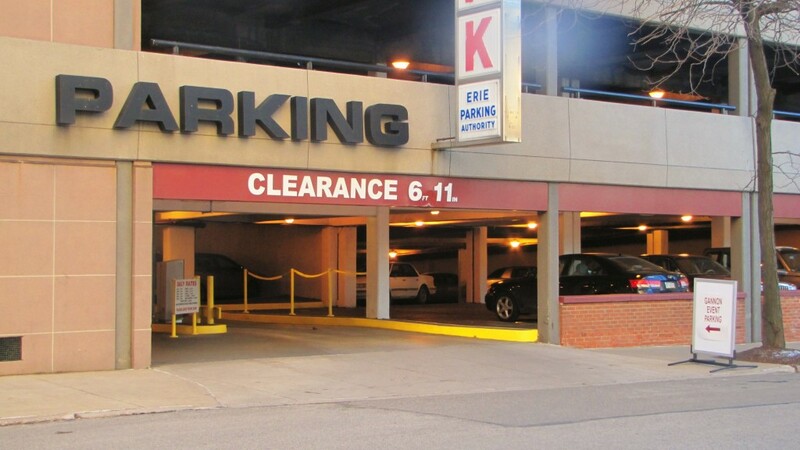 The garage offers a choice of lease parking at a cost of $60.00 per month or hourly parking ranging from $2.00 for the first hour to a daily maximum of $10.00. Evening parking from 6:00 p.m. to 8:00 a.m. is available for $4.00. Event parking is available for $3.00. Hourly parking payments can be made via an automated pay station located adjacent to the East 10th Street exit. Payment can be made with cash or credit card at the pay station. In the exit lanes on East 10th and 11th, payment can be made by credit card only. From your vehicle, simply insert your daily ticket followed by a credit card. Once the transaction is complete, retrieve your credit card and receipt ticket. Retrieving your receipt will activate the exit gate. When using the automated pay station, please use prior to retrieving vehicle and take your paid ticket to the exit gate. Do not leave car unattended in exit lane to utilize automatic pay station. Maximum vehicle height is 6 feet 10 inches with some ground level 8 foot 4 inch handicapped parking. 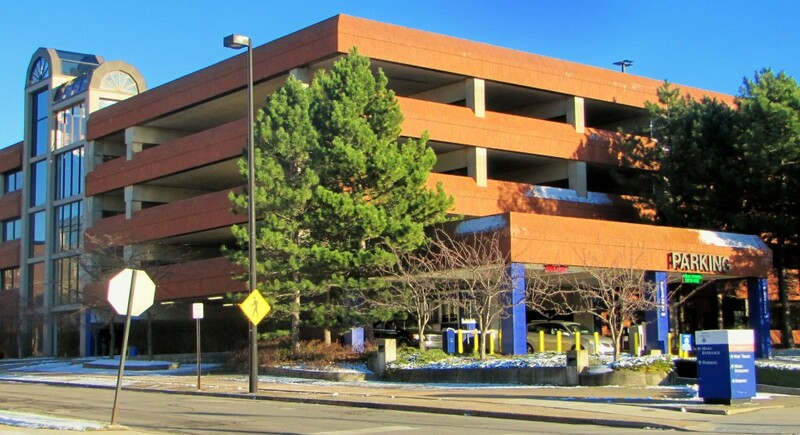 This 609 space garage located at 22 East 3rd Street is adjacent to UPMC Hamot Hospital. The garage offers a choice of either lease parking at a cost of $72.00 per month ($78.00 per month for a reserved space), or hourly parking ranging from $2.00 for the first hour up to a daily maximum of $10.00. This garage features a centralized cashier within the facility near the hospital’s main entrance. If you are paying with cash, you must pay for parking prior to retrieving your vehicle. If paying by credit card, you have the option of using the cashier or simply paying in either of the two East 3rd Street exit lanes while remaining in your vehicle. Simply insert your daily ticket followed by a credit card. Once the transaction is complete, retrieve your credit card and receipt ticket. Retrieving your receipt will activate the exit gate. This garage can be accessed via two entrances/exits on East 3rd Street with separate entrances for reserved and public parking. Maximum vehicle height is 6 feet 10 inches. 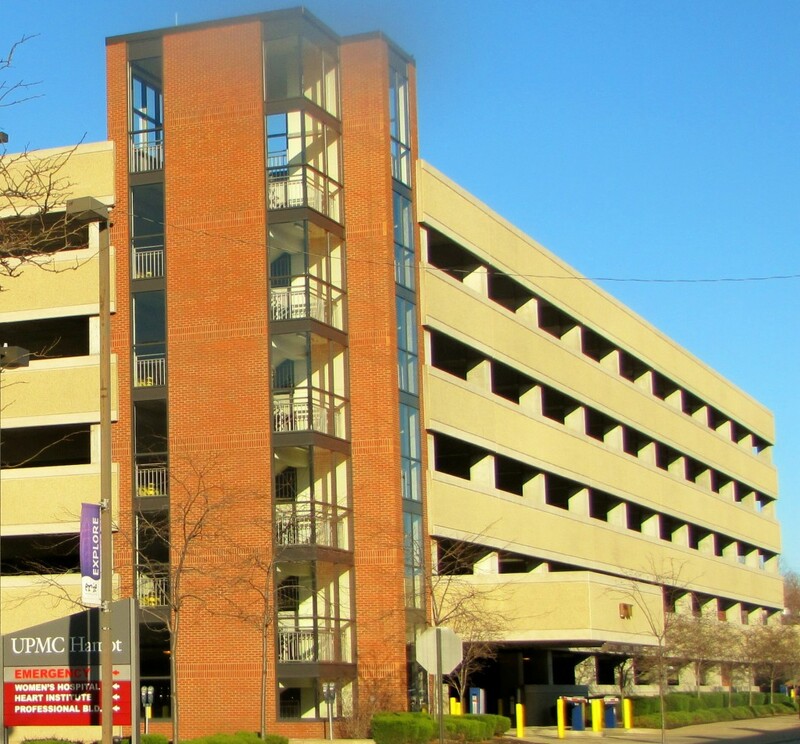 This 553 space garage located at 112 East 3rd Street adjacent to UPMC Hamot Hospital. This garage is lease parking only at a cost of $72.00 per month. The garage can be accessed via two entrances/exits on East 3rd Street. Maximum vehicle height is 7 feet 2 inches. This 490 space garage located at 231 West 25th Street is adjacent to St. Vincent Hospital. The garage can be accessed via once entrance and two exits on West 25th Street and one entrance on West 26th Street. Maximum vehicle height is 6 feet 9 inches. 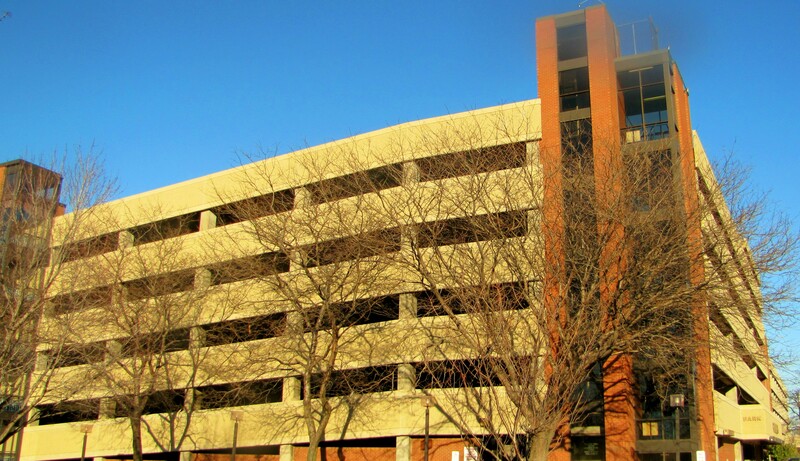 This 536 space garage located at 2501 Myrtle Street is adjacent to St. Vincent Hospital. The garage offers a choice of either lease parking at a cost of $72.00 per month ($78.00 per month for reserved space) or hourly parking ranging from $2.00 for the first hour up to a daily maximum of $10.00. For daily and non-reserved parking, the garage can be accessed via one entrance/exit on Myrtle Street. Reserved parking is accessed via one entrance/exit on West 26th Streets. Maximum vehicle height is 6 feet 9 inches. This 521 space garage located at 712 Peach Street is adjacent to Gannon University. The garage offers a choice of either lease parking at a cost of $60.00 per month or hourly parking ranging from $2.00 for the first hour up to a daily maximum of $10.00 and event parking is available for $3.00. This garage can be accessed via one entrance on Peach Street and one exit on West 7th Street. Maximum vehicle height is 6 feet 11 inches. For additional parking options please click here!